Rebranding a company is no longer as simple as tweaking your logo and slapping the new version onto your website. With so many online marketing channels available today, the process of rebranding your company image has become much more complex. In addition to updating your logo on your website, you will likely have to update it on several different online applications, and that is only the beginning. There is a long list of additional and tedious updates that must be completed across all of your online facing applications. These updates must also be completed in a timely manner, and must be communicated clearly to existing and potential customers so as to avoid any confusion or inconsistency. With all of that being said; there are definitely times when rebranding is needed. With a comprehensive rebranding strategy and the help of experienced brand strategists, the rebranding process can be quite smooth and efficient. However, it’s important to understand the many pros and cons of rebranding. It’s also important to recognize the importance of having a carefully developed rebranding strategy, in addition to having a well-organized timeline for implanting the rebranding process. In this article, we will look specifically on the Cons of rebranding and how you can try t minimize the downsides of the process. 1. Confusion can bring chaos. Change is scary, mainly because no one knows for sure what the end result will be. People can become easily confused and/or frustrated whenever change occurs. By publishing press releases, posting announcements to social media, sending email newsletters, etc., you can keep everyone aware of what’s going on, and what’s coming down the pike. Communication is crucial! 2. You may lose a few customers. If a proper rebranding strategy is not built and implemented the right way, you risk losing some of your existing customers. Unfortunately, even if you do everything right, there is still a possibility that you could lose customers. Why? People don’t like change. 3. Be prepared to spend some money. Going through a complete rebrand is NOT cheap. Be prepared to spend money on developing a creative rebranding strategy, new content, graphic design, as well as marketing and advertising campaigns to support your project. While there are ways to save money during a rebrand, it is definitely worth investing some money to ensure that it is done effectively! Many alumni and students at the university were/are pretty angry about this. “Why fix something that’s not broken?”, “why did we waste $1 million on rebranding? Couldn’t that money have been used for better purposes? !” and things of that nature have been communicated throughout social media. But, The university had a specific reason in mind. Again, as we said earlier in this article, people do not like change. I have to admit, I did not like this at all when I first saw it a few days ago, but, I’m coming around. 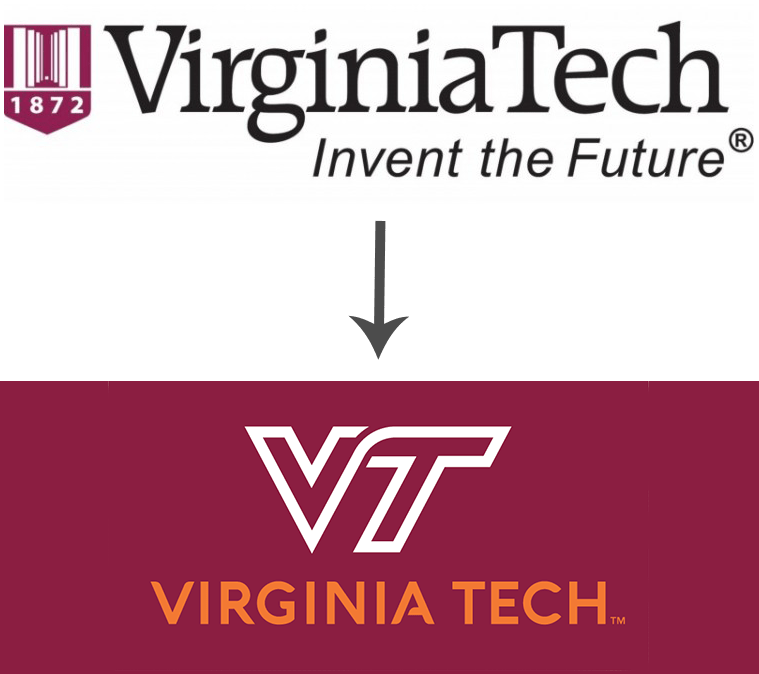 Although I am sure that Virginia Tech did not get all of the glowing reviews and 100% positive input on the new rebranding effort they were looking for, it may take time, but, folk will eventually come along to the new brand identity. When looking at the three listed possible cons of a rebranding effort, the only one that seems to stick out is the money issue. Other than that, people just are not very receptive to change, and it takes time for them to warm up to a major change. This is perhaps one of the biggest pitfalls of rebranding, but, it is one that usually dies down over a short time-frame and doesn’t necessarily lead to and significant lingering negative effects to a brand or company. When done right, rebranding a company is absolutely worth it. However, it’s important to be clear about what you hope to accomplish before you begin, and to be as transparent as possible throughout the transition. Your customers will want to hear how it’s going, so be sure to keep them in the loop. This will ensure communication remains a priority and people are not “shocked” by a sudden, complete change. Especially if your rebrand will include more than just a couple simple tweaks.